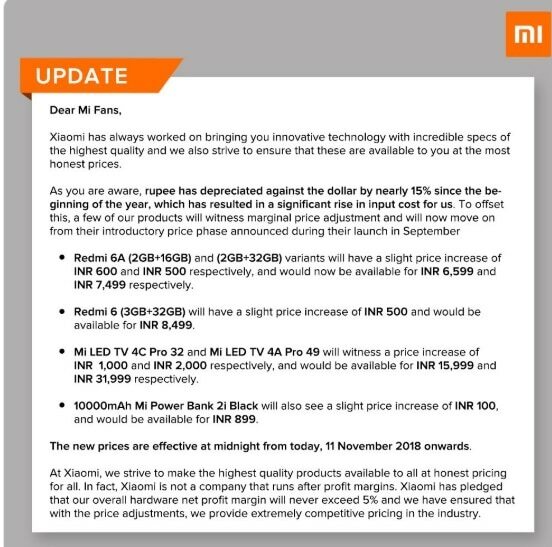 Xiaomi increased Prices Of Some Mobile Phones & LED TV, Buy Today If You Need as New Price will be Effective from 11 November 2018. As you are aware, rupee has depreciated against the dollar by nearly 15% since the be-ginning of the year, which has resulted in a significant rise in input cost for Xiaomi. Here is the Some Products, Buy if need as Price is going to Increased from 11th November 2018. 2. Xiaomi Redmi 6 – Rs 500 Increase on 11th Nov.
• Redmi 6A (2GB+16GB) and (2GB+32GB) variants will have a slight price increase of INR 600 and INR 500 respectively, and would now be available for INR 6,599 and INR 7,499 respectively. • Redmi 6 (3GB+32GB) will have a slight price increase of INR 500 and would be available for INR 8,499. • Mi LED TV 4C Pro 32 and Mi LED TV 4A Pro 49 will witness a price increase of INR 1,000 and INR 2,000 respectively, and would be available for INR 15,999 and INR 31,999 respectively. • 10000mAh Mi Power Bank 2i Black will also see a slight price increase of INR 100, and would be available for INR 899.